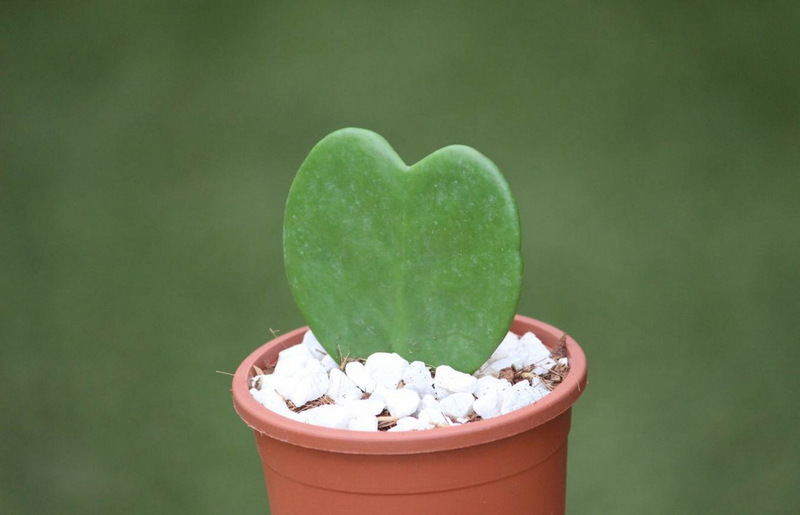 Share the post "Hoya Kerrii – Sweetheart Plant Or Valentine Hoya"
Hoya kerrii is commonly called Sweetheart Hoya or Valentine Hoya, because of its heart-shaped thick leaves. The plant is often a popular Valentine’s Day gift with a single leaf planted upright in a small pot. The plant is sometimes named “Lucky-heart”. Sweetheart Hoya is relatively slow-growing and when young, stays unchanged during many months, but then, after several years, it starts growing quickly: one meter (3 feet) by year, and eventually becomes a bushy mass of green hearts. Mature plants can reach lengths of up to 4 meters (13 feet)! The stems of the plant produce aerial roots which in their native habitat grow into deposits of humus found in crevices and branches of trees as well as absorbing moisture from the air. These aerial roots root easily when inserted into a moist medium making, so Hoya kerrii is easy to propagate from stem cuttings. 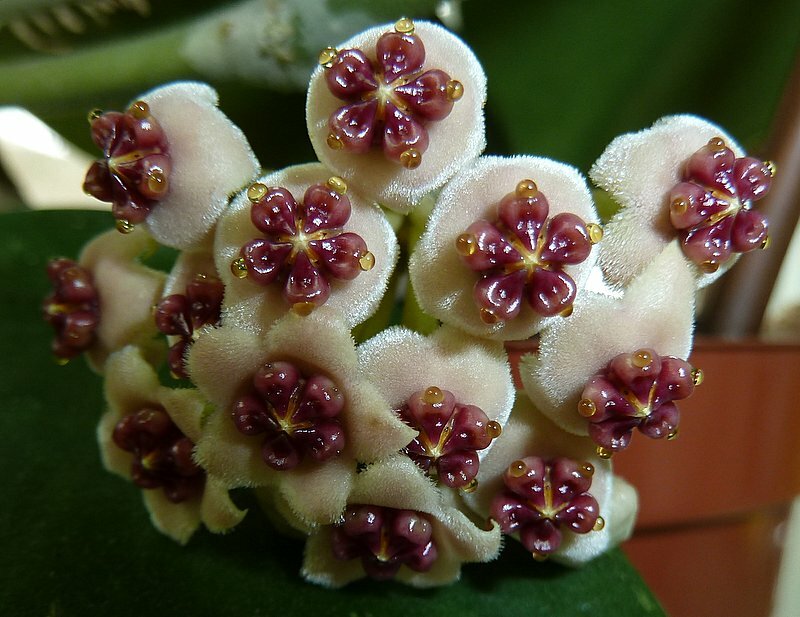 The flower shape of Valentine Hoya is typical of hoya plants. The flowers are very beautiful, waxy, tough and long lasting. Each small flower is made up of two stars, one on top of the other. The so called bottom star or corolla is larger in size than the upper centered star, called the corona. Hoya kerrii has whitish corolla’s and reddish corona’s. There are a few Hoya’s out there which make ideal houseplants, Hoya kerrii or the Sweetheart Plant is one of them. It is very easy to look after, with only minimal care. Valentine Hoya doesn’t require a lot of watering, it is a light feeder and requires little fertilizer. It would probably tolerate one-two good watering a month. Also, the plant isn’t bothered about humidity. All of this makes Hoya Kerrii a hardy and undemanding plant. It only needs a reasonably light room in order to actually grow. Moisture: Average water; do not overwater, keep a little on the dry side; relatively drought-tolerant. Propagation: From seeds. From stem cuttings. Similar to ZZ Plant. Slow-growing plant. Fertilizer: Only a little feeding is required if the plant is small, twice a year at most. Older plant you can feed a little more, but not more than four times a year. Toxicity: Hoyas are in the Apocynaceae family or common milkweed. They all produce a milky sap laden with latex and are considered poisonous. So, anyone with an allergy to latex should avoid handling the plant if it is damaged. Hoya Kerrii is listed non-toxic to cats and dogs (aspca.org), but anyway it is recommended to keep your pets away from this plant. – Seed does not store well; sow as soon as possible. – Temperature for optimal growth between 18°C – 27°C / 65°F – 80°F. – Slow grower when young but with age and good conditions the plant will cover quite a large space. – Young plants with only one leaf should start to be repotted when there is new growth. Plants in small pots which are root or pot bound are generally more likely to flower (this only applies to mature plants with many leaves). – You can try and shape your plant. If the plant hasn’t been watered for some time, the vines will lose a small amount of stiffness and will have a degree of flex. Be carefull though as the careless bending will cause damage. Do you grow Hoya Kerrii (Sweetheart Plant Or Valentine Hoya) in your garden? What is your experience with this plant? Please share with other fellow gardeners in the comments below! Do you sell Hoya Kerrii (Sweetheart Plant Or Valentine Hoya) seeds or have plants for sale? You can place your advertisement here. Contact us now!